In order to express our love and gratitude to our Beloved Bhagawan, who gave hope and succour to millions and millions of people across the globe and inspired them to tread the path of love and service by making His life His message, a congregation of devotees will be held in Sai Kulwant Hall in the evening of 4th May, i.e. the 11th day after Bhagawan left for His divine abode. Elders who are fortunate to serve Bhagawan's Mission will address the congregation on Bhagawan's Divine Commandments, His expectations and the responsibilities of His devotees. The details of that day's morning programme will be announced soon. With devotees flocking in for "Maha Samadhi" Darshan, there was an announcement made in the evening at the end of the session. Morning session would begin at 0800 hrs. with Vedic chanting for an hour followed by Bhajans till 0930 hrs. and Darshan would continue till 1100 hrs. Evening session begins at 1630 hrs. with an hour long Vedic chanting to end with Mangala Arathi at 1800 hrs. after half-an-hour Bhajans. Darshan in the evening will continue till 1930 hrs. Meanwhile, devotees who are wanting to visit Puttaparthi may take note that life in the township is normal and buses are plying as per schedule. Shops and other establishments are also opened and working normal. On this third day of Maha Samadhi, there was a continuous stream of devotees during the scheduled darshan hours, despite scorching summer. On this first evening of Maha Samadhi of Beloved Bhagawan, there was a change in programme scheudule. One hour Vedam chanting began at 1600 hrs. followed by bhajans at 1700 hrs. to end with Mangala Arathi at 1800 hrs. As darshan of Maha Samadhi commenced this forenoon at 1145 hrs. a continuous stream of devotees is pouring in to have a precious glimpse of the Maha Samadhi in Sai Kulwant Hall. Many faces are writ with deep emotion and suppressed feeling burst open at the site of Maha Samadhi. Puttaparthi that sung lullabies to infant Sathya, that fondled and nurtured Little Sathya to Sri Sathya Sai and that received the abundance of His love and care over and over again during the past eight and a half decade finally earned a day to grieve, though the day would be marked in the annals of Divine History as the most significant one, when Avatar of the age was laid to rest. ...This is definitely not of her choice, but as fate would have it, a grieving Puttaparthi had to accept this present as well, as she has been receiving over the past eight and a half decade, in abundance. It was a Divine Script that was written by Him alone and executed in His own inimitable fashion. For all the glory, happiness and bliss that she has received over and over again, when the final moment arrived, to bid farewell to the Soul of entire creation, she grieved and so were millions upon millions around the world. Bhagawan who left His mortal coil on the 24th April 2011 was laid to rest in Sai Kulwant Hall this morning in presence of a huge assemblage of devotees, also attended by a host of political luminaries. Earlier, the function commenced with an aalaap bhajan by noted classical vocalist Pt. Jasraj, that was followed by an hour-long bhajan by students. A host of prayers representing various religions, that included Jewish, Christianity, Islam, Buddhism and Sikhism followed before a set of selected bhajans, that were so dear to Beloved Bhagawan, was rendered by students bringing tears in the assemblage, taking one and all to nostalgic happy days with their Beloved "Sai Maa". The final journey of Bhagawan had the full state honours as both Governor and Chief Minister of Andhra Pradesh were present during the occasion. The gun salute was accorded and the police band played in homage as the final proceedings were on. The final rites commenced with Bhagawan's nephew Sri RJ Ratnakar performing the rites representing the family. A host of priests guided the entire ceremony that lasted 45 minutes. 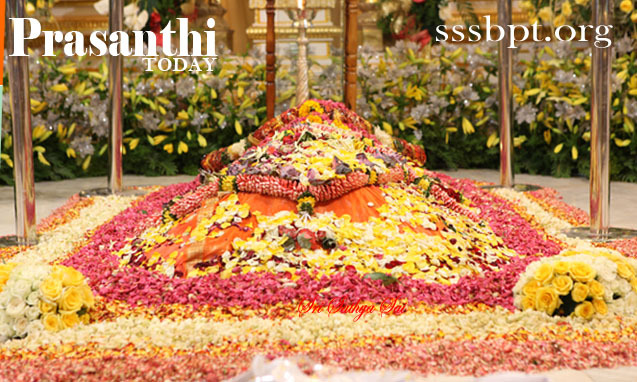 The Divine Physical Frame was lowered in a specially made pit, Samadhi on the very podium that Bhagawan used to adorn during His darshan sessions. Giant screens were erected at vantage places in and around Puttaparthi so that the devotees could witness the final rites. The look on the faces of the devotees was that of a state of shock and sadness and the township is still coming to terms with the departure of their Beloved. The Divine Physical Frame that was draped in Bhagawan's favourite orange colour was lowered into the Samadhi amidst vedic chanting. In a symbolic gesture, the ceremony was marked with gifting of a cow and clothes (godhaana and buudhaana). Special water collected from selected holy rivers across India was also sprinkled on the Divine Frame sanctifying the occasion. Among the dignitaries present were both Governor and Chief Minister of Andhra Pradesh, EVL Narasimhan and Kiran Kumar Reddy, Senior BJP leaders L K Advani and Venkaiah Naidu, former Union Home Minister and Governor of Punjab Shivraj Patil, Karnataka Chief Minister B S Yeddyurappa, Telugu Desam Supremo and former AP Chief Minister Chandrababu Naidu, former Maharashtra Chief Minister Ashok Chavan, veteran VHP leader Ashok Singhal, AP Ministers Geeta Reddy, Raghuveera Reddy etc. As fragrant Vibhuti smell wafted in the air granting the nostalgia of golden days when Beloved spent time amidst on the same dais, an announcement came that darshan would commence at 11:45 hrs. As is the case in Shirdi, this Tomb of the Avatar of the Age would start speaking to His chosen devotees now on...and would be the solace for grieving devotees from around the world. Puttaparthi beckons, with much more intensity as our Beloved Lord Sri Sathya Sai would speak from His tomb from now on!!! A zillion Pranams to the Beloved of Lord of Puttaparthi, who pulled the curtains down, in dramatic fashion, on His glorious Avataric Mission on the 24th April 2011 in Prasanthigram. At the stipulated hour at 23:30, Mangala Arathi was offered that was preceded by a round of Rudram. By then it was 54 hours of unending stream of devotional fervour, that Parthi has never witnessed earlier. An unestimated millions over millions would have watched the Divine Form lying in state in the Sai Kulwant Hall for the past more thatn two days. An announcement on the next morning's programme, that would witness the final journey of the Mightiest Avatar of the Age, who would be laid to rest in the Sai Kulwant Hall with due religious respects and government honour, was made. The programme would begin at 0700 hrs. with bhajans. After the announcement, the Divine physical frame was taken into the bhajan hall. Even as the casket was taken in a procession, thousands upon thousands joined chanting jaikras, hailing victory to their Beloved Bhagawan. Undoubtedly, for Prasanthi and the lakhs of convergence, it was indeed an odd, painful experience, at the midnight hour. Baba was the personification of the highest spiritual values of the human race - Manmohan Singh, Prime Minister of India. I pay my pranaams to Sathya Sai Baba in gratitude for giving hope to millions and millions of people - Sonia Gandhi, UPA Chairperson. Prime Minister of India, along with many other diginitaries, that included UPA Chairperson Sonia Gandhi, External Affairs Ministers, SM Krishna, Union Minister for Information and Broadcasting Ambika Soni, Panabaka Lakshmi, Union Minister of State for Textiles, Governor and Chief Ministers of Andhra Pradesh, ESL Narasimhan and Kiran Kumar Reddy respectively flew down to Parthi to pay homage to Beloved Bhagawan, this evening in Prasanthi Nilayam. Arriving in a chartered flight from Delhi, the Prime Minister and his entourage arrived at the Sai Kulwant shortly after 1700 hrs. to spent ten minutes offering homage. He even chose to speak to senior Trust officials in Prasanthi Nilayam, Former Chief Justice PN Bhagwati and SV Giri, formerly Chief Vigilance Commissioner of India. Other dignitaries visited Prasanthi this morning included Former Prime Minister of India, Deva Gowda, Gujarat Chief Minister, Narendra Modi, Vishwa Hindu Pardishad leader Ashok Singhal, Swami Nityananda of Nithyananda Peetam, former Sri Lankan Cricketer Arjuna Ranatunga etc. In the meantime, timings for Darshan of Beloved Bhagawan has been extended till midnight. It had been a case of rejoicement, great merriment for Parthi, over and over again, welcoming The Lord every morning and evening and even during His staying away at Bangalore or Kodaikanal, welcoming her Beloved back to her precincts, every time when He returned. It is indeed hard for this privileged land to bid fare-well to this most 'loving persona', Who lived a life sticking to His preaching. His Life has always been His Message and it is time for everyone who loves Him to follow the path shown by Him, and the legacy left behind by the Sri Sathy Sai Avatar. On the second day of 'departure', after enduring the separation of Her Beloved in the physical sense, the Prasanthi Nilayam township is gripped in sorrow as pall of gloom descended on Puttaparthi. Lakhs and lakhs of devotees are streaming into the Ashram, in unending lines, day and night, to have a priceless glimpse of The Lord who enthralled millions over millions during His earthly sojourn that spanned over eight and a half decade, with His Divine Darshan! Frenzy gripped the township with the unexpcted turn of event, and Prasanthi Nilayam, that has been the cynosure of eyes for all the epochal spiritual happenings over the years, is once again in the limelight, this time for a different reason, the sudden departure of her Beloved Lord. Devotees, some with unshakable faith, ever hoping against hope and not ready to accept the happening, some resigned to accept the happening and many more dwelling upon the glorious saga of Love Incarnate form a diversified feeling at the unexpected departure of Beloved Bhagawan. Regional, National and International Channels are camping in the township, capturing the events from Prasanthi Nilayam. Prime Minister Manmohan Singh in His condolence to the bereaved Sai fraternity described Bhagawan as a spiritual leader who inspired millions to lead a moral and meaningful life even as they followed the religion of their choice. "Sri Sathya Sai Baba as a preacher of the highest human values was an iconic figure for over five decades. He endeared himself to the people through various institutions, with headquarters at Prashanthi Nilayam, that promoted egalitarian values, education and public health," said the Prime Minister. Prime Minister Mr. Manmohan Singh is expected in Prasanthi Nilayam, in the afternoon, today. Former Cricket legend Sunil Gavaskar and the current icon Sachin Tendulkar joined the unending list of dignitaries paying obeisance to Bhagawan, in person. Cricketers VVS Laxman, S. Sreesanth, Telugu Film Actor Arjun, Yoga Guru Baba Ramdev etc. also had been to Puttaparthi paying tributes to Bhagawan. Unending lines of devotees are streaming even at late night into the wee hours of Tuesday morning, to catch a precious glimpse of Beloved Bhagawan. In and around Parthi, many shop keepers and individuals are engaged in philanthropic, service activities, serving food and essentials to visiting devotees. As the news spread, thousands upon thousands are flocking into the Prasnathi Nilayam to have the darshan of Bhagawan Sri Sathya Sai Baba. This includes commoners to celebrities to government dignitaries. As per the announcement, Bhagawan’s physical frame would be lying in state for two days, Monday and Tuesday, allowing devotees to have darshan of Bhagawan. As announced, Bhagawan’s physical frame was brought into the Sai Kulwant Hall after 1815 hrs., in a glass cascade, in a procession led by Vedic chanting and bhajans by students of Sri Sathya Sai Institute of Higher Learning. Clearly in Parthi the mind had not lost its way into the dreary desert sand of dead habit. Taking its cue from ‘Little’ Sathya, who started a ‘Pandhari Bhajan’ group at the age of ten, many continue this tradition in Puttaparthi. Even at the age of five He was a Guru to His friends, setting an example with His ideal behavior. For Ramanavami, the children would make Sathya sit next to the picture of Sri Rama, placed upon the flower bedecked bullock cart that gently ambled its way through the village. The Pandhari Bhajan group consisted of twenty ‘little’ members. They would dye their clothes light orange, wear scarves and garlands, and bell – anklets. While some carried flags in their hands, some had little wooden clap sticks, as well as drums and a harmonium. Sathya would compose the bhajans and teach His friends. Thus, these tender aged ones would sing and dance and go around the village, to the great delight of the elders. When they ventured out to neighbouring villages, people would clean their houses to welcome them and feed them too. The villagers firmly believed that it was because of this remarkable Pandhari Group and their devotional singing that the dreaded epidemic of cholera kept its clutches away from Puttaparthi. Though Sathya was the ‘littlest’ of this assembly, He was the soul of the Pandhari Group and its most active member, often jumping and dancing in rhythm to the hymns. Today, the Bhajan Hall in the Hanumanji Temple complex has devotional songs reverberating through the ether every evening. The clanging of bells and other holy chants that ring out from elsewhere simultaneously makes the environment intensely devout and potent. The walls of this bhajan hall, are adorned with many a unique picture of Bhagawan. There is a magnificent, thought provoking, lifesize painting at the back of the hall that depicts the churning of the Ocean and Lord Shiva as well as Beloved Bhagawan, swallowing the poison that spewed forth. From then till now He is still doing so in order to shield and save humanity from its own follies. Even as ebony and ivory exist peacefully on a piano keyboard, Parthi too, through the ideals of their cherished Sathya, has made this harmonious blend a way of life. 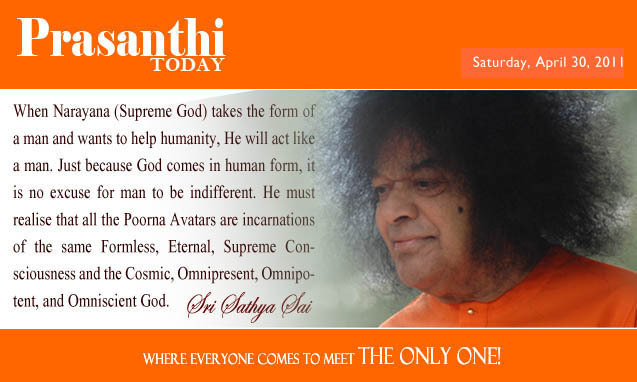 In a world filled with despicable diatribe, their hearts are full of Beloved Sri Sathya Sai. In the meanwhile, weather was cloudy throughout the afternoon for the second consecutive day with bit of moisture in the air, giving respite from peak summer. His respiration is supported by ventilator. He is put on CRRT system of dialysis to assist kidney functioning. His heart rate and blood pressure continue to be low and continue to be supported by drugs. There is no significant change in His overall condition since yesterday. The doctors, however, are continuing vigorous, round the clock treatment of Bhagawan Baba. Bhagawan Sri Sathya Sai Baba continues to be in a very critical state of health. There is very poor response from the vital organs of the body to the treatment. The intermittent episodes of low blood pressure are persisting indicating that the heart is quite weak. The parameters of the functioning of the various organs of the body are also erratic. Every attempt is being made to keep them in the normal limits by the administration of appropriate drugs. The breathing is still assisted by the ventilator. One successful cycle of low haemodialysis was conducted during the past 12 hours to assist the kidney functioning. Doctors are continuing vigorous efforts to make the vital organs recommence their function. 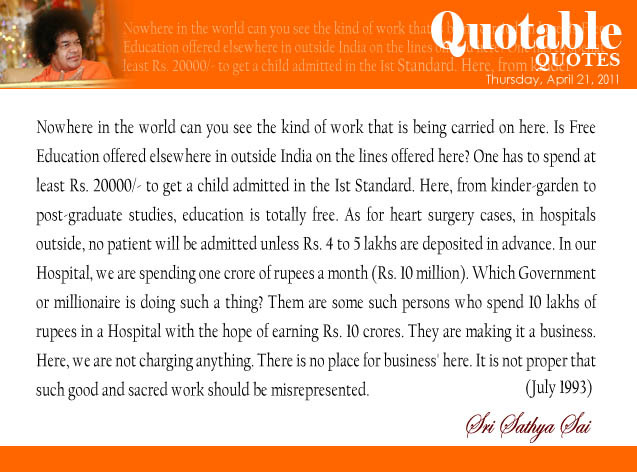 The health situation of Bhagawan Sri Sathya Sai Baba is very critical. All the organs are showing very poor response to the treatment. Non-functioning of the liver and persistent episodes of low blood pressure are causing great worry to the doctors. However, most of the parameters have still been kept at nearly normal levels by the use of appropriate medicines. The breathing is still ventilator dependent. And the process of slow haemodialysis has been started in the morning to assist the kidneys. The doctors are putting their best efforts to improve His clinical condition. Bhagawan Sri Sathya Sai Baba continues to be in a critical state of health. His vital parameters and indices are maintained at a nearly normal level by giving adequate treatment, with medicines. The condition of liver and intermittent episodes of low blood pressure are still causing anxiety to the treating doctors. The panel of treating doctors has been reinforced with the joining of Government of Andhra Pradesh team under the guidance of the Director of Medical Education, Dr. Ravi Raj, who is an eminent nephrologist. Dr. Yegyaraman from the United States who is an eminent electrophysiology specialist has also joined the team of doctors. Bhagawan Baba continues to be on assisted ventilation. He may be dialysed again early in the morning tomorrow. The panel of doctors are woking hard on His treatment, which is going round the clock. Bhagawan Sri Sathya Sai Baba continues to be in a critical state of health. Although His vital parameters and indices are nearly normal, yet the condition of the liver and intermittent episodes of low blood pressure are still a cause of worry. He continues to be on assisted ventilation to help His lungs and on CRRT to assist His kidney functioning. The panel of doctors are watching Him round the clock and giving all the necessary treatment to keep Him in a stable state of health. And in the township, the previous evening it was clearly a play of rain and reign…the natural elements were openly lending their support to the persistent pledge of prayers, by not only the residents of Parthi, but devotees all over the world, in whose hearts Beloved Bhagawan reigned supreme. The roar of thunder fuelled the storm of devotion in every heart, the gusty winds carrying their devoted fervor echoing into the ether, only to mingle with fresh wisps of adoration throughout the planet. 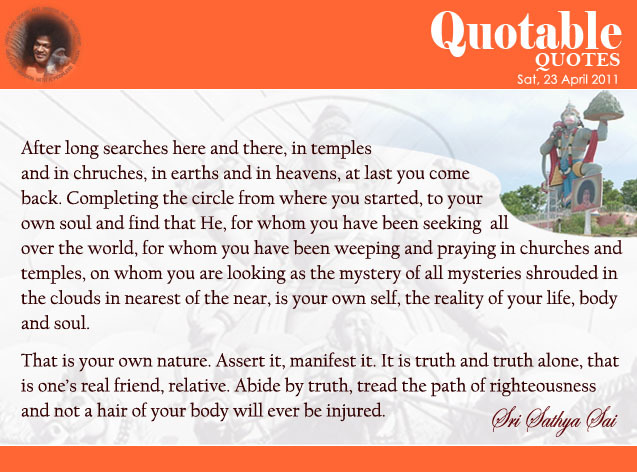 They had made a firm choice – Ours is not to question why… ours is but to follow Bhagawan Sri Sathya Sai. And so it was, that the crusade of their trust, faith, love and hope was not to be overcome or disturbed by the tiresome tirade of tattered tongues. Bhagawan Sri Sathya Sai Baba continues to be in a critical state of health. His vital parameters of health are quite stable and satisfactory although the vital organs are showing slow response to the treatment, yet the doctors are hopeful of the eventual success of the treatment given to Him. He continues to be on assisted ventilation. His kidneys are supported by CRRT system. The panel of doctors treating are watching the status of His health continuously. The sky was overcast in the evening bringing a monsoon touch during the ongoing peak summer. Intermittent drizzle coupled with lightning and thunder made it all the more nostalgic of the summer that is still a month and a half away. Bhagawan Sri Sathya Sai Baba who was admitted to this hospital on 28th March continues to be in a critical state of health. His vital systems, including liver, are showing minimal response to the treatment, which is a cause of worry for the treating doctors. He continues to be on ventilatory support and CRRT system of dialysis. His blood pressure continues to show periodic fluctuations, which is being corrected by appropriate drugs. The panel of doctors attending upon Bhagawan Baba is keeping close, constant watch of His health parameters. In the meanitime, devotional fervour and sadhana of Parthi continues. On the the previous Monday evening there was a special pageant from the village of Gokuntlapalli, near Bukkapatnam. This gathering comprised of simple village folks of all age groups - men, women and children, who with great fervor and dedication, carried placards in their hands that had pictures of Shirdi and Parthi Sai, as well as a ‘get well soon’message for their Lord, in English and Telugu. The candles of hope that they held in their hands, were placed around the parapet surrounding the deities under the lush green foliage of the Peepal tree. Twilight gently crept in, and the twinkling stars watched with delight, even as some of them offered flowers of worship to Lord Ganesha. The procession then continued to the Hanuman Mandir where an amazing moonrise waited to greet them. The full Moon, brilliantly golden hued, seemed to be worshipping Sathyamma, paying obeisance to Her, with its silver rays caressing her beatific profile and lotus feet. The Goddess, dressed in stunning green silk sari with a red border, smiled resplendently. It being Hanuman Jayanti the entire temple complex was bathed with moon beams that seem to enchant and be enchanted with the bhajans and chants, the pealing of bells and the aarati that was being offered to Bhagawan. Devotees prayed to Hanumanji, the valiant one, who is considered the most devoted, to bring forth the Sanjivani and carry their appeal to their Lord to be amidst them soon. In this sacred village, prayers and adulation continued in every temple, street and home, for the wellbeing of the cherished Son of Parthi, verily the Soul of Parthi and the entire creation. They had witnessed the alarming time of the ‘scorpion bite’ and the full manifestation of little Sathya, into Bhagawan Sri Sathya Sai. Over the years, they were aware of and had experienced His control over time and space and the elements too. For them the unrestrained urban utterances and their wily ways were only dust in the wind. Determined were they to win their Lord back with their love and adoration. Bhagawan Sri Sathya Sai Baba continues to be in a stable state of health and is also maintaining stability in the vital parameters of His health. The functioning of the liver is a little worry to the doctors treating Him, so is the slow improvement shown by other organs. The panel of doctors is keeping a continuous round of clock watch on His health condition. He continues to be on assisted ventilation. It is proposed to conduct a cycle of hemodialysis during the late evening. His overall health condition continues to be critical. Bhagawan Sri Sathya Sai Baba who has nearly completed three weeks of treatment in the hospital continues to be in a stable state of health. Most of His indices of the functioning of the organs and vital parameters continue to be nearly normal. However, the condition of liver and occasional spells of low blood pressure continue to worry the treating doctors. Over all condition of Bhagawan Baba still continues to be critical, however, the panel of doctors treating Him are watching His health round the clock and are satisfied with the response, although slow, shown by Him to the treatment. Now on to the valley of peace and her penance for her Soul, Puttaparthi is determined to be on the inward path, the true Sadhana. Along with collective bhajans and many a potent chant at various temples, individual efforts too are being stepped up. From ringing of temple bells, to offerings of worship to the various deities, to prayers with family as well as in seclusion – there is only one desire in all hearts – the well being of Beloved Bhagawan. Adding to it comes Narayana Seva, at individual and group level, an activity that symbolises and stimulates serving the needy. Turning away from the world and its ways, ignoring its baits and lures, cacophony and chaos, knowing it to be tinsel and trash, Parthi has decided to make its own world – where Shraddha reigns supreme and Saburi is the crowning glory. Faith and Patience continues from Shirdi to Parthi, at this hour of need, understanding and being aware. Bhagawan Sri Sathya Sai Baba continues to show stability in the vital parameters of His health. He is still on assisted ventilation, and on CRRT to help His kidneys. The condition of the liver is causing a slight worry to the doctors, but they are quite hopeful to rectify it in the coming few days. He still continues to be critical and the panel of doctors and foreign specialists are watching and treating Him round the clock. Bhagawan Sri Sathya Sai Baba completes His 20th day of stay in this hospital. The vital parameters of His health are nearly normal. He continues to be on assisted ventilation. He is also receiving CRRT system of dialysis. His liver functioning is as yet to recover fully. He continues to be in a critical state of health and is being constantly watched by the panel of specialist doctors attending upon Him. In the meanwhile, Puttaparthi was calm and serene in the previuos evening. Oblivious to malicious talk and unperturbed by vicious pens, Puttaparthi continued her Sadhana, in a calm vein. In temples and individual homes chants and bhajans rang out. The village geared up for akhanda bhajan and night-long vigil and hence there was no procession on the streets last evening; however, the inner procession continued nonstop as it should be. The world over the feeling should be thus: Where the mind is without I, and the heart full of Sai, into that heaven of freedom, Oh Lord let my soul awake!!! Bhagawan Sri Sathya Sai Baba continues to be having stable parameters of health. He continues to be on assisted ventilation to help the lungs. CRRT, the process of slow hemodialysis, is being given to Him since morning to assist His kidneys. His biochemical and hemotological indices are nearly normal. The progress is however slow. The overall condition of Bhagawan continues to be critical. The team of doctors attending upon Him is joined by two experts from the US. Dr. Kalapathi K. Gutupalli, professor-in-chief, pulmonary and critical care medicine, Baylor College of Medicine, Houston and Dr. Sridhar, Cardiac Specialist from University of Colorado, Health Sciences Centre. Bhagawan Sri Sathya Sai Baba continues to be in the same stable condition of health as yesterday. All His vital parameters continue to be nearly normal. The panel of doctors treating Him are satisfied with the response, although slow, shown by Him to the treatment. They are satisfied with the stability of the parameters and other indices of His health. He continues to be on assisted ventilation and CRRT (slow long period dialysis) and is being constantly monitored and watched round the clock. He continues to be in a critical state of health. Last evening Parthi received an extra grace, as heavens opened up bringing the first touch of rain upon Mother Earth. With bhajans on, raindrops came falling down for ‘her’ first touch on Mother Earth on this hallowed land of God. This refreshing shower was accompanied by occasional thunder and lightning. Cool breeze wafted through the valley of peace spreading fresh fragrance all over making it heavenly. And it appeared that this day's procession was reserved for the celestial ones, who took their cue from the village folks of Parthi. They too worshipped the Lord with sound of thunder (bhajans) and instead of candles sent out flashes of lightning. Indeed, rain was the grace of the Beloved!!! In the latest review, as of today, the doctors attending on Him have expressed confidence that He is in a stable condition and is responding satisfactorily to the treatment being given to Him by the team of doctors, though somewhat slowly. They are confident that, if the progress continues to be stable and satisfactory as at present, it might be possible to shift Him from the hospital to His residence at Prasanthi Nilayam in about a fortnight. His residence is being got ready in all aspects to receive Him and provide Him the required level of follow up medical care as also emergency services. Bhagawan Sri Sathya Sai Baba continues to have stable status of health. His vital parameters and indicators of functions of various organs of the body like the blood pressure, blood gas analysis, bio-chemical values continue to be nearly normal. There is slight improvement in all His systems, though slow. The panel of doctors is satisfied with the progress shown by Him to the treatment being given to Him. However, He still continues to be critical and is breathing with the help of the ventilator and is being given kidney supporting through CRRT system of dialysis. 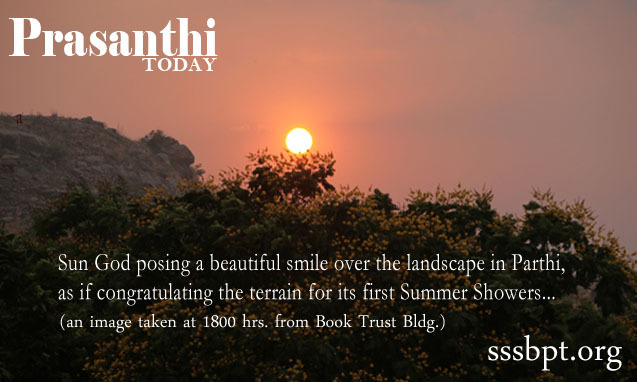 For the continuous second day in succession clouds kept the scorching summer cooler in the township; while it was an overcast sky last evening that came as a blessing, this evening Puttaparthi received the bonus, with a summer drizzle, cooling the terrain from the summer onslaught. Bhagawan Sri Sathya Sai Baba continues to be in a stable state of health. Most of His vital systems have shown positive response to the treatment being given to Him, but the response is slow. All His clinical parameters of health are nearly normal and are showing improvement over the previous values. He continues to be on assisted ventilation and on intermittent dialysis. The panel of doctors are satisfied with the response shown by Him to the treatment. However, His condition continues to be critical. In the meantime, Parthi township is abounding with religious processions and devotional congregations involving great devotional fervour. Thursday was reserved for the men folk of Parthi to express their devotion. Hundreds gathered outside Ganesh gate with candles in their hands, a prayer in their hearts and hymns in praise of their Lord on their lips. Chants of ‘Om Sri Sai Ram’ rang out aloud and echoed in the ether. Accompanying this devoted gathering was a floral float drawn by a tractor. Colorful bouquets and flowers bedecked the gigantic photo frame of Beloved Bhagawan. They passed on their ‘candles of love, hope, faith and worship’, as an offering, which was collected by sevadal and devotees from inside the Ganesh gate and made to adorn the parapet surrounding the deities under the canopy of the peeple tree opposite Ganesha. Bhagawan Sri Sathya Sai Baba continues to be stable clinically with nearly normal parameters of vital indicators of health like heart rate, blood pressure etc. However, His health is still in a critical state. All His systems are showing improvement, although slow. The doctors are satisfied with the response shown by Bhagawan Baba to the treatment. Giving respite from summer heat Prasanthi experienced overcast weather this evening. Maximum temperature recorded was 40, the lowest being 25. Bhagawan Sri Sathya Sai Baba who completed 18th day of treatment in this hospital is in a relatively more stable condition of health. All His vital parameters like heart rate, blood pressure, blood biochemistry values are nearly normal and stable. He still continues to be on assisted ventilation, and intermittent slow hemodialysis is being conducted upon Him to assist the kidneys, which are now showing signs of sustained activity. The doctors attending upon Him are satisfied with the stability of His health condition and His response, although slow, to the treatment being given to Him. Bhagawan Sri Sathya Sai Baba who was admitted in this hospital on 28th March is responding to the treatment, although the response is slow, which is expected in view that Bhagawan Baba's body is 86 years old. He still continues to be on ventilator supported respiration. The response of His kidneys is also encouraging, yet the need of dialysis is felt and therefore, He is being given a slow intermittent hemodialysis. The doctors attending upon Him are now quite hopeful about the success of the treatment being given to Him. He continues to be critical. Bhagawan Sri Sathya Sai Baba who is under treatment in this hospital for multi-organi failure is showing positive but slow response to the treatment given to Him. He is still on ventilator and is on intermittent hemodialysis. His vital parameters of health are nearly normal. The continued stable state of health is a matter of satisfaction to the treating team of doctors, although He continues to be critical. Bhagawan Sri Sathya Sai Baba continues to be stable as far as His vital parameters of health are concerned. He still continues to be on intermittent hemodialysis and is on assisted respiration. Although He is responding to the treatment, yet the response is slow. His condition still continues to be critical. The vital parametrs of His health like the heart rate, blood pressure, blood gas values continue to be stable and at nearly normal levels. His response to the treatment is positive but slow, which is a slight cause of worry to the team of doctors attending upon Him. His liver functions are slowly recovering. Today is auspicious Sri Rama Navami, the day that marks the Advent of Lord Sri Ram...Commemorating the occasion, Prasanthi is singing day-long bhajans from 0900 hrs. to 1800 hrs. today. Bhagawan Sri Sathya Sai Baba who continues to be under treatment of this hospital is showing positive response to the treatment being given to Him. He continues to be on the ventilator and is undergoing dialysis periodically. His kidneys and lungs are showing sings of improvement. His hemodynamic values like heart rate, blood pressure, blood gas analysis are nearly normal. The functioning of liver is also showing improvement. His over all condition is much better than earlier although He is still critical. Bhagawan Sri Sathya Sai Baba has entered His 15th day of treatment in this hospital. His condition is stable. There is an overall improvement in the functioning of all the organs although it is slow. He continues to be on the ventilator and on intermittent dialysis. His liver is also showing improvement in its functioning. The doctors attending upon Bhagawan Baba are satisfied with the improvement shown so far, though He still continues to be in a critical state of health. Bhagawan Sri Sathya Sai Baba continues to be in a stable condition. His health parameters like heart rate, blood pressure, blood chemistry indices and hemodynamics continue to be stable. His respiration is still supported by the ventilator. His kidneys have started functioning slowly but still need the assistance of dialysis to support them. The panel of doctors working on Bhagawan Baba are satisfied by the response shown by Him to the treatment so far. There is improvement in the functioning of all the other organs also, including the liver, but the rate of improvement is slow. The doctors hope that the rate of improvement will improve further. Bhagawan Sri Sathya Sai Baba who entered the 14th day of treatment in this hospital has shown slight improvement in the functioning of the kidneys. However, He continues to be on intermittent slow hemodialysis and ventilatory support. His vital parameters of health are stable and satisfactory. The panel of doctors treating Him is satisfied with the progress He is making. Bhagawan Sri Sathya Sai Baba continues to be stable and there is slight improvement in the overall condition of His health. He continues to be on the ventilator and periodic slow hemodialysis. The functions of the kidneys and lungs are also showing improvement. He is responding satisfactorily to the treatment being given to Him by the panel of doctors. Bhagawan Sri Sathya Sai Baba who entered His 13th day of treatment in this hospital had a fairly stable night as regards to His vital parameters. There is perceptible improvement in the condition of His kidneys. He is on intermittent low hemodialysis. His lung infection has cleared to some extent; however, He is still on the ventilator. He had a mild rise of temperature for which He is on appropriate antibiotics. Doctors attending upon Him are on the whole satisfied with His stable condition of health and response to treatment. The health condition of Bhagawan Sri Sathya Sai Baba continues to be stable. All His vital parameters are nearly normal. His kidneys are continuing to show signs of recovery. With the good news spreading across, there is a sense of relief in the spiritual township, with many believe that their unified prayers are being answered by Bhagawan. Over that past more than ten days, ever since Bhagawan was hospitalized, Prasanthi has been engaged in incessant prayers, imploring ‘her’ Soul to return to Prasanthi. Bhagawan Sri Sathya Sai Baba who was admitted in this hospital on 28th March, 2011 is showing positive signs of response to the treatment being given to Him. His blood pressure and other clinical parameters continue to be nearly normal and satisfactory. His kidneys are also showing signs of recovery. The state of His consciousness also continues to show improvement. Indices of other vital organs like the heart and liver have also shown improvement. He is in a stable condition of health, though He still continues to be on the ventilator and slow dialysis. The panel of doctors treating Him is optimistic about His recovery. Bhagawan Sri Sathya Sai Baba continues to be on ventilator support for respiration. His kidney function is being supported by CRRT. There is some positive sign of recovery in the functions of the kidneys. His vital parameters are nearly normal and are satisfactory. He continues to be on treatment in the Intensive Care Facility of the hospital where visitors are not allowed. The panel of doctors treating Baba are satisfied with the response He is continuing to show to the medical management given to Him. As reports on 'Unified Prayers' are pouring in from all over the world, earnestly praying to Beloved Bhagawan to recuperate and be in the midst of His devotees, Prasanthi Nilayam presents a picture of absolute peace with every heart and soul immersed in a single, unified thought, focussed on Beloved Bhagawan. Bhagawan Sri Sathya Sai Baba continues to be stable and His health on the whole is in the same condition as it was yesterday morning. His vital parameters are near normal including the functional indices of vital systems like heart rate, blood pressure, blood bio-chemistry and blood gas saturation levels. He continues to be on ventilator to assist His lungs and to allow the secretions to be sucked out. The dialysis process has been further reduced. The level of consciousness continues to show improvement. Although His state of health is still critical, yet the panel of doctors treating Him is satisfied with His response to the treatment being given to Him. "Sometimes I have to take on these illnesses. This happens to all Avatars. It happened to the Shirdi Avatar and the Krishna Avatar. Though all these are not recorded, all incarnations have taken over the sufferings of devotees. God does His duty, whether it is recorded or not. I am ready to take on the sufferings of anyone, when they cannot bear it. I am ready, ready, and ever-ready for this. Bhagawan's health conditions shows marked improvement as reported by SSSIHMS this morning at 0800 hrs. Bhagawan Sri Sathya Sai Baba who has entered His 10th day of treatment at this hospital is in a stable state of health as He was yesterday. There are signs of improvement in the functioning of His kidneys although He is still on dialysis. He continues to be on the ventilator for assisting His respiration. The blood pressure and all other parameters are satisfactory. The panel of doctors treating Him is keeping a constant watch over His health condition. All other vital parameters are nearly normal and satisfactory. He is under constant watch of the panel of doctors treating Him. On this auspicious day of Ugadi, an Akhanda Bhajan was conducted from morning 9 to evening 6:15 hrs. at Sai Kulwant Hall in Prasanthi Nilayam, attended by thousands of devotees. SWAMI DEVELOPED DIFFICULTY IN BREATHING. HE IS PUT ON SUPPORTIVE RESPIRATORY DEVICE. HE IS NOW BREATHING EASILY. ALL OTHER VITAL SYSTEMS ARE FUNCTIONING NORMALLY. THERE IS NO CAUSE FOR ANXIETY. Doctors Day 02 from RadioSai on Vimeo. Swami_speaks_on_media from RadioSai on Vimeo. There have been innumerable calls and emails from devotees all over the world enquiring anxiously about the well-being of our most Beloved Bhagawan. In order to allay the anxiety of devotees, Dr. A.N. Safaya, Director, Sri Sathya Sai Institute of Higher Medical Sciences, Prasanthigram had issued a medical bulletin on 28th March 2011 that a permanent pacemaker had been implanted. As per the latest information received this evening, Bhagawan's condition is fast improving; He had a restful night; The panel of doctors attending to Him have noted improvement in Bhagawan's clinical parameters with satisfaction. The medical team is also increasing His nutrition levels carefully. Time and again Bhagawan has reiterated that He is the Indweller (Dehi) and not the physical body (Deha) and hence there is no suffering for Him. Yet, we devotees, deeply attached as we are to His charming Divine Form, cannot but pray to Him fervently to cure Himself and continue to guide humanity towards the ultimate goal, the task for which He has incarnated.